Once upon a time, somewhere in ancient India, there was a Brahmin living. His wife was complaining him on the regular bases about their poverty. They were running short on fulfilling their own basic livelihood, including food. The Brahmin decides to do a Yagna (a ritual) to make the God happy and help him improve his living standards. Though he was in need of a calf, to fulfill his vedic ritual. He decided to meet the king of his village next day to get his wish fulfilled. Next day when he was going to the king’s place, he met several village people. He was unhappy though when the people tried asking you about “where he is going in hurry?” There were three crooks sitting at a remote place on the way, got to know that the Brahmin is going to the king’s place to demand a calf, and he will surely got it. The crooks were planning to steal the valuables from someone, smartly. The Brahmin goes to the king’s place and flatter him a lot. In return the happy king have ask him for anything he is looking for. Then he gave a calf to the Brahmin, which he placed on his shoulders and head back to his home. On the way, one of the crook met him, pay respect to him and asked where he is head to with having a donkey on his shoulder. The Brahmin got angry and scold him for calling a calf, a donkey; and moved ahead. After few yards, the second crook met him, paid respect to him and asked where he is head up to with holding a donkey on his shoulder. As Brahmins are considered as respected people and it will be shameful for him to have a donkey on his shoulder. The Brahmin found offended and he got angry on the fellow. Though he moved ahead by ignoring him, he started thinking that, “Is it true, that I am holding a donkey instead of a calf on my shoulders?”. On the way, after a few yards, the third crook met him and asked him the same question and did the same comment. The Brahmin then think, “it is assured that I am holding a donkey on my shoulders, otherwise, why everyone who is meeting me are telling the same? May be its my mistake”. It is easy to guess, what could have happened then after. But, let me leave it up to your imagination. It would be better to watch it yourself. 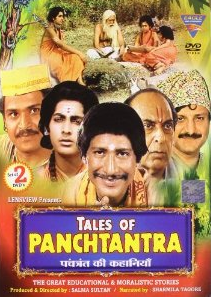 Harish Patel played the role of the protagonist very well. Other people played their part fine. Overall a watchable experience, if you can avoid the poor quality of video.